As you can see by the picture, the Rooster is a flamboyant and colorful character. Their aim is to be tops at what they do. However, Roosters can also be very volatile and should try to avoid acting on the spur of the moment. They are organized and like to plan their various activities well in advance. Fire Roosters can handle large tasks and are capable of multi-tasking. They have the ability to succeed beyond their expectations and are capable of accumulating a considerable sum of money throughout their life. They usually exhibit no hesitation in speaking their mind. They love discussion and enjoy taking part in debates. However they can also appear quite reserved or shy and may need to work on being more confident. Astrologically this year will be an excellent time for moving full steam ahead and with clarity so that you and your work in the world can get closer to the fullness of potential. Now is when you need to work smarter, not harder. There is a very active imagination here that does not always like any interference from other people although it may be in ones best interests to take advice from others every now and again. Consider joint ventures that will carry you to greater strength and visibility while conserving the qi reservoir. Its a good time to get involved in fulfilling your purpose with more focus and passion. The Rooster values achievement, loyalty, practicality and resilience, and is always alert to opportunities. This person is a very strong willed and proactive person. This year is the year to focus on your intentions regarding love, money and business. Roosters will do well in PR and the media, make friends readily, are involved in many groups and are very caring people. The Fire aspect is powerful to create transformation and in many ways that looks like destruction. Work on being in sync with the flow of the changing circumstances that come your way. Being overwhelmed is not on the agenda. The Rooster calls us to wake up and and be ready. Get new projects started and flow with the passion that Fire instills in you. It is a time for change and new beginnings. Let’s get going. See what other things Susan Levitt has to say about this year. Here are some tips to make your holidays happier, healthier and more beautiful. Breathe. Makes you more calm. Gives you time to back up and take in the important stuff and let go of the garbage. It lowers your blood pressure which may make everyone around you happier. Exercise and Energize. Now is the season to replenish the stores. Yes, some appreciate the winter wonderland and all those snowy activities but remember to stay warm and eat to nourish well. Bone broth is a great way to do this. Look back at a previous blog (Jan 2016) for that recipe. Exercise does not have to be in the snow but avoid the tendency to hide in the back of the cave and not come out until spring. Have to use it or you will lose it. Accept and Appreciate. Take a look around. Even the simplest things have great value. Give them the respect they are due. Accept that what you have is perfect in and of itself. Understand more. Lots of fear going around these days. The answer is not always packing a pistol. Take time to really listen and understand people and situations. It’s also called respect. It goes a long way to release the fear and resultant anger. Understanding also weighs less than a gun and can be just as powerful. Tolerate more. We need more Love, less Hate, but that is hard for many people. So I suggest you, at least go to neutral and just tolerate others. You will never be surrounded by people with whom you always agree on everything. Just too many of us. So take a deep breath and let go, move on. You. This is where you get to be #1 (that’s ‘number’, not ‘hash tag’). You do get to have others care for you. You do get to be first. You know how others like it when you give to them. Take a deep breath in and accept what they want to give to you. Then say ‘thank you’ as you exhale. All the energy you absorb will energize you, make you calmer, stronger, more patient. Have a wonderful holiday season and a joyous and beautiful new year. OK. So what does that mean. For some people cooking is all about the letter of the recipe. It needs to be laid out precisely. I will admit it makes it easier to read but these are simple recipes. One is a soup. You can add as much as you want to spice it up. Empty the refrigerator. Make notes so you can come close to replicating it again. Clarify how much is enough or too much of an additive. What I want you to do is “let go”. Just make a soup. Taste it as you go and be creative. This soup involves some vegetables you may not usually eat. Maybe you’ve never eaten them or only heard yucky stories about them – turnips and kohlrabi. You can’t be serious Carol. “Why not” I ask? 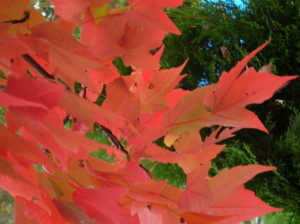 In the fall, which is Lung season, it is good to focus on white food. I know a lot of you think white food is awful—too many of the wrong carbs. I tend to follow the “all things in moderation” philosophy. Some them are just good to eat. This is the time to nourish the Lung energy, Metal element, so you can have the reserves you need for winter. Besides what can we usually plan on sharing this season – colds and flus. Let’s not do that this year. Try this as a base and experiment. Med turnip peeled and diced into 1/2” pieces. Med kohlrabi diced the same. Daikon radish scrubbed and diced the same. You can get a bigger one and keep it in the frig. It can be sliced thin and used raw in salads (see recipe below). Get some chicken broth 2-4 cups and cook the turmip until it is soft—about 30 min. Let this broth cool. Put this in a blender to cream. 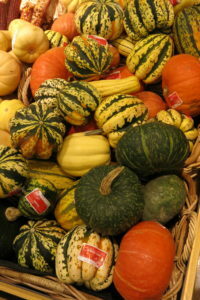 You can then add diced kohlrabi and sweet potato, pumpkin, or any other winter squash to the pot. These will add texture and sweetness and balance each other. For extra flavor there is always ginger, onions or mushrooms, celery… Try it and makes notes like I said. 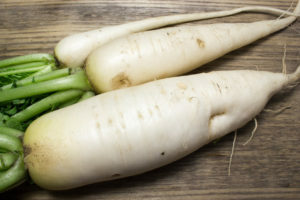 It’ll be OK.
Veggie of the season: Daikon, which is the big Japonese radish, is good for Lung energy in this season as are the white veggies. It helps clear phlegmy coughs and is good if trying to stop smoking. I first ran into a variation of this salad after coming back from Japan and wanting to try my hand at Japanese cooking. Being that you don’t have to cook I thought is was an easy place to start. Get a small to medium daikon and scrub it well. Use a coarse grater and grate away until you have a cup or two. Get some carrots and do the same. You want about equal amounts of each. You can julienne both the daikon and carrot if you prefer. If you don’t have rice vinegar, get some. It has a great mild vinegar flavor that can moderate other stronger ones. If you want a more tangy base for dressings, but not too tangy, this is a good one to add. You’ll need about a 1/4 cup of rice vinegar, maybe less if you have less daikon and carrot. Mix in a tablespoon of sugar or honey. Heat this up to help it mix. When it is a still a bit warm pour it over the veggies and let them marinate. A teaspoons of sesame oil adds a nice flavor. You can also sprinkle some dried fish flakes for a very Asian taste. Did you know that there are different types of cough? Some are more wet, phlegmy and others, dry and hacking. 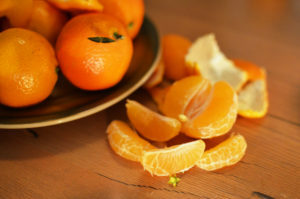 For a stronger formula to clear phlegm you can add some tangerine peel to the mix. You need to plan ahead on this as it will take a few weeks for the peel to dry. Just peel the fruit and save the peel. Julienne cut this up. You can also grate it off and add to mix. If you have a dry cough, a great way to moisturize the Lungs is to eat pears with the peel – western or Asian. These will also be great to continue eating in to the winter to nourish the Yin and Kidney energy. Have fun playing with your food this fall! I was reading a few articles the other day on kids going back to school. 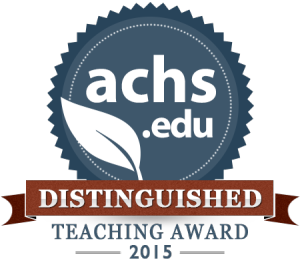 Another busy year of learning and growing. Hopefully they get a teacher that inspires, supports and nurtures them as they try on new subjects to expand their awareness and abilities in life. The wrong one(s) can really be a child’s undoing. Now the concept of homework is changing. S chool systems are starting to review studies that say younger children in grade school may do best without having homework. I hear a lot of parents exclaiming how wonderful that they don’t have to beg and nag their child to knuckle down and do homework when their ability to focus is not as developed as it will be. Parents have enough to do and with even more limited time to be with their kids they don’t want it to be a mental tug-of-war. However, we probably all remember the ordeal of homework and some of you may think that this will be a mistake (hard to let go). Rest assured, though, that homework is not going away for all students. They are finding that junior high and high school do better when they do have homework. They have better attention spans and need to learn to focus, set goals and understand that “good things come to them who wait (or finish their homework. )” There is always a give and take in life. Here is where the yin and yang come into a clearer focus—work earns you money, better grades or play time. Since the goal, hopefully, is a better education and job they will be rewarded for the effort put forth. Make sure your aren’t overburdening your kids, both mentally AND physically. 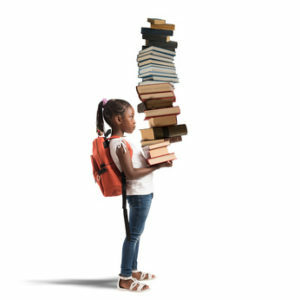 According to the Chiropractic Association, “a child’s backpack should weigh NO MORE than 10% of the child’s weight”. Check out this link and see a great X-ray of someone carrying a shoulder bag and how you strain your back. It’s not good at any age, but for the growing child, it shouldn’t be allowed. Reflection time – what will Feed your soul? Hopefully you have spent the summer planting and tending your ‘garden’ and now you have a lot to harvest and treasure. This not only refers to food but also to friendships, work accomplishments and other life goals. Summer is when we are the most active and have the longest days to put our efforts into our projects. We have extra time to go for walks after a day’s work and spend more time in activities with our families. If this is not what you have done then this is a good time to reflect on your goals and how and why you try to achieve them. We have incredibly busy lives and we seem to make them busier and busier. Motivation may be a difficult thing to maintain if you over-book yourself. You can just get too tired. Maybe you need to find a better organization system, get assistance or just don’t put so much on your plate. You really can’t do it all as much as you think you can or want to. To say you can’t is almost politically incorrect and a sign of weakness. What we need to do is take an honest reflection of what WE are capable of accomplishing with what we have to address the requirements of family and work and the extras. Perhaps we added school on top of it all. Is going to every football game and race a reality if you insist that you will only settle for a grade of “A”? Take a look at who and what are creating your goals and expectations and if they don’t belong to your authentic self then this is a good time to work on letting them go. You should be fulfilled at this time of year with all the bounty you have created and gathered in your life, not exhausted. The bounty you have created this summer is what fills your storehouse to carry you through the cold, gray and dreary fall and winter ahead. Work on planting only that which you want to reap. It should feed your soul. With this newsletter we celebrate moving on but continuing to share and grow. Scott Stuart, my partner of over 11 years is leaving this practice. He will continue to be seen around the place from time to time, perhaps filling in, completing tasks for closing his practice, etc. It is a semi-retirement for him as he will be continuing to teach at the American College of Health Sciences. 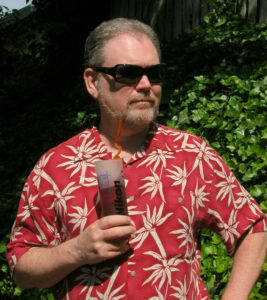 Scott has a lifetime of experience with eastern western herbs and highly enjoys teaching them to the herbal students. An advantage of these classes is that they are online and that makes it easier for him to have more free time. Of course Scott will miss his acupuncture patients in the office. Oriental medicine has been a means for him to help people—body, min d and spirit. He has thoroughly enjoyed his practice and has many friendships and memories that will stay with him forever. We will stay in touch. I will continue to confer with him regarding the perfect formula, as I greatly value his input. We both look forward to having new colleagues joining the office and continuing the legacy of great treatment and care for you, our patients. But that is for another newsletter. Have you ever given your friends valentines and little heart-shaped candies on Valentine’s Day? Have you ever crossed your heart when making a promise that you really mean? Or turn on the radio to hear a guy singing about his broken heart? We see and hear about hearts everywhere. A long time ago, people even thought that their emotions came from their hearts, maybe because the heart beats faster when a person is fearful or excited. In Chinese medicine the heart is the motive force behind blood circulation. In Traditional Chinese Medicine (TCM) it is the physiological function of the heart to propel blood through the blood vessels, just as it is in conventional western medicine. In addition, TCM says that the heart houses the “mind”. In this case, mind has a broad meaning to include the outward appearance of the whole body and a more narrow meaning of consciousness which means “spirit” and thinking. Both of these aspects together are called Shen. Spirit, consciousness, thinking, memory and sleep are all related to the heart. The element associated with the heart is fire, its season is summer. Its sound is laughing and its emotion is joy. From the above quote by Hur Jun, we can see that illness was seen as coming from dysfunctional emotional states between the heart and the spirit or “shen”. To the ancient physician, the range of habitual patterns of imbalance is based on a disordered spirit that is not able to rest tranquilly in the heart. In other words, when your head and heart are balanced and in agreement, you are on the right path. When you have realized your passion in life it nourishes the heart. Without passion and joy we may look elsewhere for that nourishment. All organ-meridian systems are interrelated. The Heart/Fire creates or is mother to the Earth Element of the Spleen and Stomach. When the Fire of the Heart is not nourished we may turn to nourishing the Heart’s “child” the Spleen and Stomach in an attempt to also nourish its mother, the Heart. This imbalance may result in obesity, digestive complaints and other related health issues such as Type II diabetes.. In this pattern we can see how a disease can come from the “Heart”. This is not only true of us as individuals; it is true in for the world in which we live. Fear, anger and resentments cause hearts to clench like fists. We can readily see this play out in daily headlines and we can wonder has our world gone sick? To heal a society is to replace anger with forgiveness. To replace resentments with gratitude. To replace fear with love. This is indeed the prescription for true healing from the ancient physicians. As much as herbs and acupuncture are good medicine, true healing also comes from the heart. There is no flower that has been revered and celebrated as much as the rose. As the archetypal queen of the flowers and the definitive symbol for love and appreciation, the rose has endured in its beauty and significance for hundreds of years, inspiriting people throughout history. In addition, the rose is perhaps the only flower that has so many diverse meanings. For example, a red rose stands for true abiding love. A white rose means purity and innocence, and a yellow rose means friendship and “I care”. But, did you know that the rose is also very good medicine? “Stop and smell the roses” may be a cliché but the old saying suggests that appreciating the meaningful things and people in our lives may play an even larger role in our overall happiness than previously thought. Acknowledging the value and meaning of something—an event, a behavior, an object—and feeling positive emotional connection to it is actually good medicine. As is the scent of a rose. The scent of rose has been enjoyed throughout the centuries in the form of attar of rose or rose otto, which is the distilled essential oil of the blossom. Or in the form of Rose Absolute which is extracted through a chemical process. Aroma therapists may disagree over which is best, but most agree that rose absolute has a stronger, richer scent. The two main species of rose used for rose oil are Rosa damascene damask rose and Rosa centifolia cabbage rose. It can take up to 250 pounds of roses to make one ounce of rose oil. It is expensive to make, and dealers may dilute rose oil with geranium oil or oil of palmarosa because they contain the two main constituents found in rose oil. So if you want to buy some true rose oil, know your source and don’t buy on the cheap. As in virtually all essential oils, rose is for external use only. Properly dilute all essential oils in lotion or vegetable carrier oil before massage or other topical use. Keep out of reach of children. If you are pregnant, nursing, have any health conditions, or are taking medications, please consult your healthcare provider prior to using essential oils. Rose oil is used in cosmetics, perfume, and even in confections and candies—especially in the East. The scent is stimulating and uplifting to the mind. It creates a sense of well-being. It is almost intoxicating and aphrodisiac. And the virtues of rose do not end with the oil. The buds and blossoms themselves are good medicine, too. The value of roses as herbal medicine is sometimes neglected, possibly due to the high price of the pure essential oil and the relative rarity of the tincture. But the price of a remedy rarely deters a physician or client when an effective medicine is required. Up into the 18th century, physicians, herbalists, midwives, barbers and cooks appreciate the value of rose flower for its use in digestive and menstrual issues, headaches, stress and tension, liver congestion, poor circulation, fevers, eye infections and skin complaints. Perhaps rose has been somewhat neglected in the western world because the ancient European herbal theories have also been neglected. However, those energetic principals have been preserved in other herbal traditions. The petals are used traditionally in Europe to aid digestion and as a tonic to the nervous system and the endocrine system. Traditional Chinese Medicine uses them to remove blood stagnation, nourish the skin, and improve digestion. In Ayruvedic medicine, rose is used to balance emotions and tone and cool the skin. Rose is known to open the heart chakra which is associated with love, joy, inner peace and intuition. Rose is currently being researched for its anti-cancer abilities likely due to its high level of geraniol, which has been shown to prohibit cancer cell growth. Rose is a member of the plant family rosaceae, which includes plums, cherries, peaches, apricots, and almonds as well as apples and hawthorns. We have all heard that an apple a day keeps the doctor away. And you may not know that hawthorn berry, leaf and flower have demonstrated positive effects on heart health and mood. Next time you think about having a cup of coffee, try some Golden Milk instead. Drinking a cup of Golden Milk every day could keep the doctor away! Golden Paste can also be used in smoothies, to make salad dressings, in curries, or any way your heart desires, and pets love golden paste too! Following are two easy recipes for this healthful elixir. You have probably heard of turmeric by now, and its effective use to reduce inflammation and joint pain. This herbal root has been used in Traditional East Indian and Chinese medicine for thousands of years. It is often used in Indian cooking and is what makes curry yellow-orange. It promotes the flow of Qi (vital energy) and is commonly used in Chinese medicine for women’s painful periods, pain and swelling due to trauma, especially shoulder pain. Recent scientific research as uncovered additional benefits for this bright orange root. Two cups milk. You can substitute soy, almond, coconut, rice milk if dairy is avoided. One teaspoon dried turmeric or one half inch fresh root, sliced or diced. One teaspoon dried ginger or one half inch fresh root. Other options are a little cinnamon, or some vanilla. Warm milk in a saucepan over medium heat. Add turmeric ginger and pepper and stir well if using dried powders. Bring to a simmer and heat for another minute or two. Take care not to boil. Remove from heat, cover the p[an and let it sit and infuse for ten minutes. Strain if using fresh, chopped roots and serve warm. Another option for making this health enhancing elixir is to make Golden Milk from Golden Paste. Making Golden Milk is so easy, and by making a Golden Paste ahead of time, you can enjoy a nice hot cup of Golden Milk in minutes! Because turmeric is fat-soluble, using virgin coconut oil not only increases turmeric’s health benefits, but it adds one more way to use this healthy fat every day! You can use cow raw milk, but any milk can be used. Black pepper’s piperine increases curcumin’s bioavailability by 2000%, and the taste is undetectable in the Golden Milk. Not feeling the Bern? Unthrillary about Hillary? Do you feel like your brain has been in a blender this election season? Are you just a little anxious about wars and rumors of wars, April 15th taxes, global warming, and terrorist living on your block? If you are feeling overwhelmed with anxiety and frustration, your local acupuncturist has some help for you. Anger, irritability, stress and frustration are all signs your liver Qi is not flowing smoothly. In turn, too much of these feelings in our lives can cause the Liver Qi to become stuck, resulting in issues such as the symptoms listed below. Your liver is one of your hardest working internal organs. It filters over a liter of blood every minute. It is responsible for detoxifying, nourishing, replenishing, and storing blood. It also acts to energize you by releasing stored sugar. And it recombines amino acids to create the protein our bodies need to grow and repair tissue. From the standpoint of Chinese Medicine, the symptoms we associate with “Stress” are seen as “The Branches”. In Chinese Medicine, we also treat “The Root”. In many cases when it comes to STRESS, a “Root” is Liver Qi Stagnation.Foods Used to Address Liver Qi StagnationThese are just some of the herbs and foods that are believed to help Liver Qi stagnatio In Traditional Chinese Medicine (TCM) the liver is associated with the element “Wood” and spring time. When thinking of the association of Wood with the Liver, imagine a thicket of golden stemmed, leafy green bamboo sprouting and expanding upwards and outwards in the spring sun. The bamboo gracefully moves and bends with the breeze. If the bamboo and its roots somehow become bound and constrained, imagine the frustration of this growth. When the liver’s energy or Qi is free to flow unbound, you feel flexible, bending with the breeze. When liver Qi is “stuck” you feel frustrated, irritable, moody, even depressed. . All those things we mean when we say, “I’m stressed-out.” Spring is the ideal season to pay attention to your liver and liver Qi stagnation. An important function of the livers is regulating the smooth flow of Qi (vital energy) throughout the body and moderating our emotions. When this Qi does not flow smoothly it is referred to as Liver Qi Stagnation, one of the most common imbalances treated by acupuncturists. Acupuncture treatments and traditional Chinese herbal formulas are excellent ways to address “Liver Qi Stagnation”. Finding and treating the “Root Cause” of your health care concern is a hallmark of Chinese Medicine. Oregon City Acupuncture offers you De-stress acupuncture sessions this spring at a 50% discount from now to June 1st. Call today 503-653-1468 for your appointment and get that Liver Qi moving again.